The bankrupt City may have to sell off its impressive art collection to pay creditors. 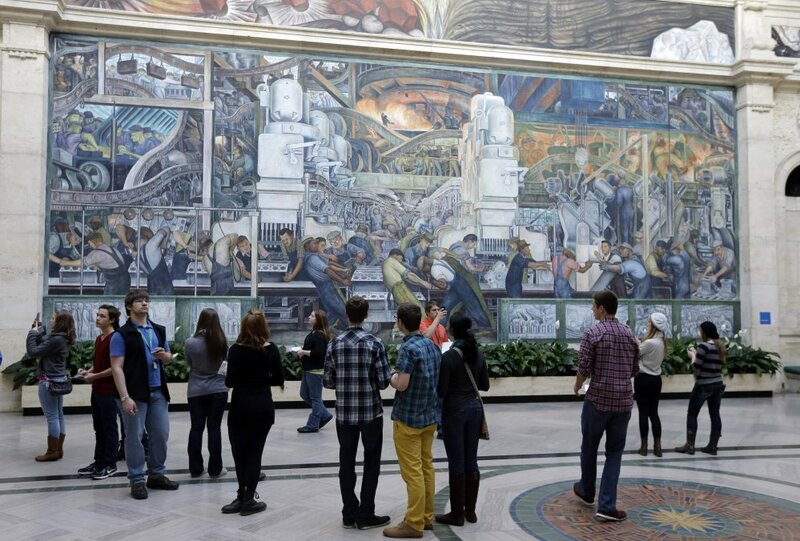 DETROIT — Detroit may have to rely on the generosity of strangers to keep its impressive art collection that was amassed with taxpayer dollars in better times. The bankrupt city is expected to learn this week the value of roughly 2,800 of its pieces at the Detroit Institute of Arts when New York auction house Christie’s delivers its final report to Kevin Orr, the state-appointed emergency manager who runs the Motor City’s finances. Christie’s, which has been poring over the collection for months, said it will include recommendations for how Detroit might make money while maintaining ownership of some of its most valuable pieces — including Degas’ “Dancers in the Green Room,” Pissarro’s “The Path” and Renoir’s “Graziella.” But the city may have to sell off works many consider integral to the cultural soul of the city in order to help repay creditors, including retired public workers whose pensions could take a huge hit. Orr had warned museum officials of the works’ potential fate, creating an outcry in the art community here and elsewhere. “I think it’s so important that we can’t let it fail,” said 68-year-old philanthropist A. Paul Schaap. Schaap and his wife, Carol, have pledged $5 million to help offset expected losses by city pensioners in Orr’s restructuring plan for Detroit. A local foundation also has stepped up, heeding a call by U.S. District Judge Gerald Rosen, who is acting as chief mediator between Detroit and its creditors. Rosen is reaching out to foundations to raise $500 million to keep the artwork from being sold. Citing debt of at least $18 billion, as well as rising pension and health care costs and a revenue stream too small to pay the city’s bills, Orr filed for bankruptcy in July. A federal judge on Dec. 3 allowed Detroit to become the largest U.S. city to enter bankruptcy. “Everything is on the table,” Orr told The Associated Press on Thursday. “If there’s money in hand, then we’ll re-address what’s on the table. If there’s a proposal, it is very welcome. We hope it comes to fruition. We hope it is significant, and that perhaps will change the discussion. Even selling off the entire city-owned collection may not be enough. Christie’s has determined the fair market value of all the city-owned pieces is between $452 million to $866 million. Detroit’s two employee pension funds are short $3.5 billion, according to Orr. Christie’s alternatives to selling the art include using it as collateral to secure loans or lines of credit and creating a partnership with another museum where the art would be leased out on a long-term basis. The auction house also said the city could establish a trust from which U.S. museums “rent” the city-owned art. Minority interests would be sold to individual museums. Revenue from the sale of these shares would be paid to Detroit. “They all seem like feasible alternatives to an outright sale, assuming of course that there are counterparties willing to engage in the outlined transaction and that the monetary return from the transaction is not so significantly less than the monetary return from an outright sale that all creditors rebel,” said John Monaghan, a partner in Boston’s Holland & Knight law firm. Bruce Babiarz, a spokesman for Detroit’s Police and Fire Retirement System, said pensioners welcome any support from the private sector. That pension system has about 8,500 members and, along with the General Retirement System, has been in court-ordered mediation sessions with the city. Schaap hopes Rosen’s appeal to foundations and others for donations does the trick in offsetting losses and helping retirees.